The language concept for Elementary classes is based on the principle of the Dual Immersion Method. This is also known as the one person – one language approach. Each teacher speaks in either English or German to the children. Students begin to associate the teacher with the language, and language learning happens in a spontaneous and playful way. 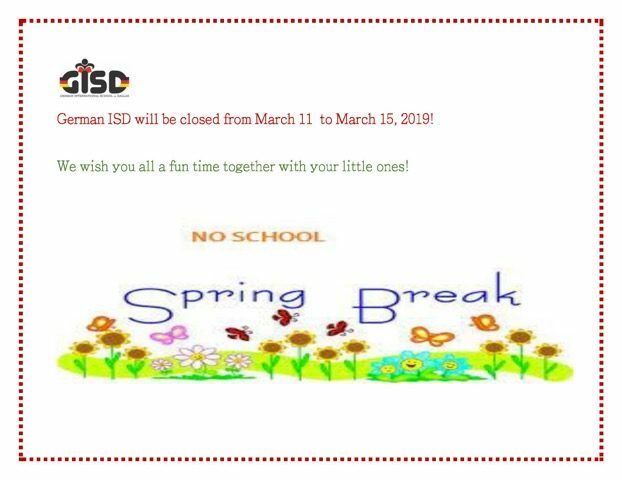 German ISD strives to provide excellent conditions that increase the chances of acquiring a language in an effortless, child-friendly environment that inspires and supports student success. Generally, young children acquire a second language easily. Human linguistic ability is designed for multilingualism. Multilingual children are regarded to be linguistically agile in the long-term, to think more critically, and to be more open to learning and styles of other cultures internationally. At German ISD, each school day is split and separated into two languages: English and German. Contemporary research shows that the early onset of dual-language instruction promotes overall cognitive development. • Multilingual children have a greater awareness of language. The acquisition of the native language benefits from the use of different languages. Children can develop faster interpretations and structures from the context. They reflect on the languages and try them out playfully. They will learn other languages easier. • Multilingual children have higher social sensitivity. • They have greater mental flexibility and can implement abstract thinking. • Multilingual children can be better able to consider different perspectives. • The longer, more intense, and more varied the immersion situations are, the better the development of competencies. First comes the comprehension, followed by the speaking. The longer a child is in the bilingual institution, the better the second language will be developed. 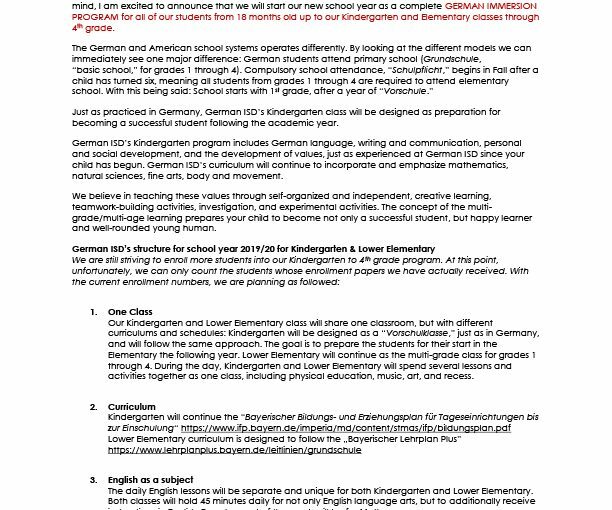 German ISD offers a state-equivalent school program based on the Texas Essential Knowledge and Skills for Elementary Classes (TEKS) standards and the LehrplanPLUS Lehrplan für die bayerische Grundschule. 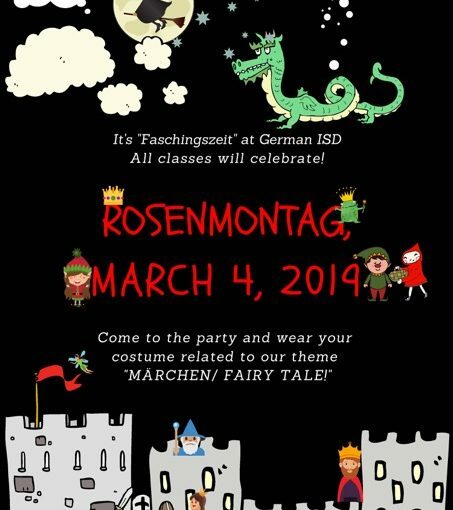 The program complements the full immersion approach of the German ISD Preschool and Pre-K classes with a German-English bilingual curriculum for children ages 5 to 10 years, in order to ensure continuity with the instruction in the Texas early elementary grades. The dual-language immersion program is designed for students with German as either a first or second language, with the goal of learning two languages without one language replacing the other. A team of two certified teachers per classroom – one of which is a native German speaker and the other a native English speaker – will lead the program. The program provides a range of benefits above and beyond traditional non-bilingual school programs through the connection of our native-speaking German teachers and native-speaking English teacher. It entails academic concepts such as literacy, science, mathematics, movement, arts, and music. Our goal is for children to develop the essential skills that build the foundation for lifelong learning within positive social and emotional experiences. The program will facilitate learning using children’s natural curiosity, imagination, and thinking skills. German ISD’s curriculum is designed for a child to achieve maximum growth as a learner, through a specifically designed German-English bilingual curriculum for children from 5 to 10 years of age.